Good Morning and welcome back to Motivation Monday! I've been meaning to post this content for quite some time and figured there's no better time than the present! 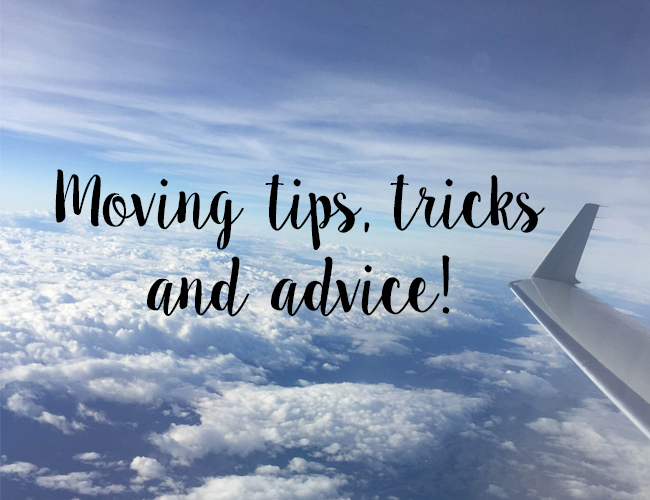 I thought it might be helpful to share some of my tips, tricks and advice for moving across the country. My move took months of planning and researching so if I can make the process easier for anyone else I'm happy to do so! I'm posting this today, because making big moves can take a lot of confidence and motivation. I know taking the first step to do so can be scary, but it may also be the best decision you'll ever make! Just a forewarning this post is long - you may want to go heat up some coffee and find a snack! 1. Take the time to plan. First and foremost, you must plan. 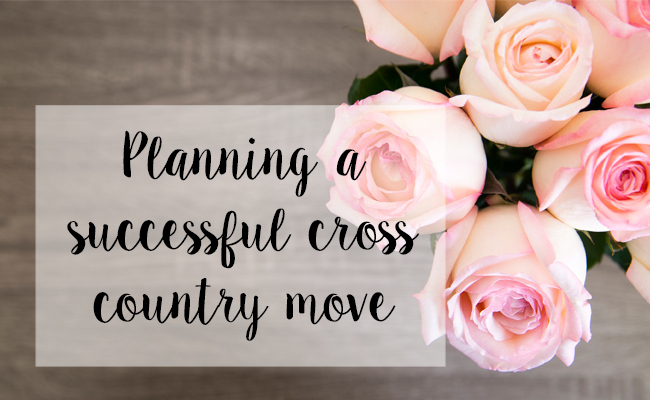 There are a lot of moving pieces and parts whether you're going cross country or even down the street. Things will start to happen very quickly and you need to make sure you've thought of everything so that your move stays on track and small things don't fall through the cracks. Justin and I sat down and planned out expenses, dates, and expectations. When you're moving to be with someone else you have to take both of your schedules, space and money into consideration. I'm a planner by nature so I constantly make lists. I highly recommend making a list of everything you can possibly think of that you might have to do, pay for, schedule, or change (like your address). 2. Create a timeline. This is so crucial! 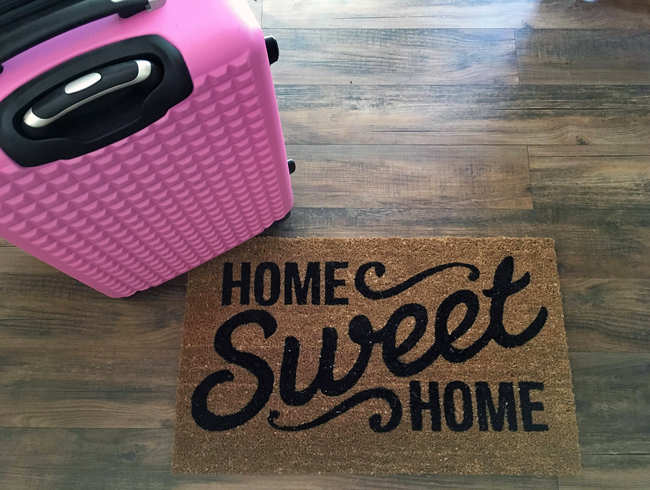 When I made my move I decided to leave my job without getting a new one first, so it was extremely important I knew when to put in my final notice and how many paychecks I would need before leaving. So I made a list while planning of all my expenses, and then decided how many paychecks I would need to afford them, while having enough in savings to spend several months without a job. This dictated my move date and made it easy for me to choose the month I wanted to say farewell to Roanoke. Keep in mind, this can take time. I decided to move back in November, but didn't actually move until March. 3. Read the rental fine print. Part of my expenses ended up including the cancellation of my apartment lease. I had signed until June, but knew I didn't want to wait that long to move. So I ended up losing my deposit, which was originally money I had factored into income. When I asked about canceling earlier on in the year I was told I would indeed receive my deposit, but upon reading the fine print realized this was actually not the case. So make sure you see things in writing when changing the terms of your lease. 4. Find inexpensive fares on flights. I've been told that Tuesdays are the best days to book flights, but honestly have never noticed a major difference. I chose to look daily and fortunately had the flexibility to choose the date I wanted. I ended up moving on a Wednesday because it was the cheapest flight I could find. I would also recommend Southwest. They are notoriously cheaper AND you can have TWO bags that fly free, which is amazing when you're moving. I was able to check two large suitcases and take a carry-on for free. Plus, their pet fares are a lot less expensive than other airlines (the flight attendant on my first flight even let me take Heidi out). 5. Shop around for movers and do what you can yourself. When you google movers you'll get all sorts of companies and a wide range of prices. Many will ask you for your email up front and unfortunately will then proceed to inundate you with phone calls and emails with pricing for a slew of vendors. I actually had a vendor tell me it would cost over $7,000 to move my items cross country - and I only had a room and a half worth of stuff! SO...I ended up choosing a relocube from UPack. It's basically a pod and my experience ended up being absolutely wonderful! We packed the cube at the loading station to save money which was a good workout for my dad and I haha - and then a couple days later - ahead of schedule - it was dropped off in our driveway in Sacramento. We had three days + the weekend to unpack it and then they picked it back up! So easy and much less expensive than any other service I could find. 6. Clean out clutter. I clean out clutter on a regular basis, but it's particularly important when you're moving. Why pay to move a bunch of stuff you don't want or need?! Since everything has to go, it's a great time to really deep clean your closets. Ask yourself... "Do I love this still? Do I wear this? Do I use this? Would my significant other want sparkly pink pillows (haha)? Is this old? Would someone else benefit from this more than me?" If the answer is no, then get rid of it, donate it, or sell it! 7. Sell what you don't need for extra cash. I made the majority of my moving money by selling A LOT of stuff. I found a Roanoke Yard Sale page on Facebook with over 20,000 members and was able to sell most things within 5-30 minutes! Just make sure to price your items to sell and advertise them properly with great descriptions and pictures. I sold drawer sets, my couch, a vanity, rugs, makeup (mostly to friends), wall art, etc. Just be careful and aware of who you sell to, especially if you use a site where you can't do your own "background check." I always looked at people's pictures before selling so that I knew I wasn't inviting a shady lady or crazy creep to meet with me. 8. Use Instagram to your advantage. Another social media outlet that can be very helpful is Instagram. 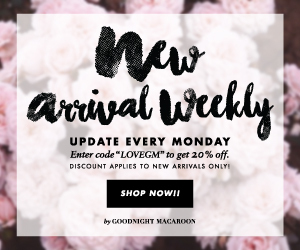 You can win all sorts of items or contests and you should definitely try. I know some people are leery of entering, but I've won three $50 gift cards to TJ Maxx by posting items I purchased in their store - and used them to pay for some of my luggage I needed to travel! 9. Make sure you're covered. This is the least fun and most complicated part of moving yourself if you don't have a job lined up. Or even if you do and you'll have a lapse in coverage. Make sure to sign up for health insurance! Since I didn't want to pay over $700 a month to use COBRA I had to get onto California state insurance - the health exchange you've heard so much about. They were very friendly and helpful, but it can be a long process so start early! Most states have their own website you can go to if you're wondering where to start. 10. Stock up on necessities & medications. I wasn't sure how long it would be until I started working after I moved so I made sure to budget for and stock up on any medications I or Heidi would need, plus toiletries like contact cleaner, facial cleanser, lotion, etc...even mascara! After stocking up on quite a few items I realized I couldn't ship liquids or perishable items in my relocube so I ended up shipping them ahead of time. It cost me a little more, but I didn't have to pay for overweight luggage and it was nice to have several less things to pack. 11. Change your address ahead of time. Don't forget to change your address with the postal service. You can do this ahead of time, as their site allows you to pick a date for mail forwarding. Better to do this a week or two ahead of time so that your mail doesn't have to get rerouted. Also, remember to change your address on all your credit cards and accounts - I made a list of all of mine so I would remember when the time came to do so. 12. Keep track of expenses and paperwork. You never know when your card may get charged incorrectly or when you don't get a deposit refunded so make sure to keep all your receipts, paperwork, and emails. I also kept track of all my expenses so I could make sure I wasn't going over my allotted budget. 13. Prepare for pet travel. If you have a pet that is small enough to travel you'll want to make sure you're prepared. Not all animals are happy in an enclosed space (i.e. Heidi) and this can present some stressful issues if you don't have everything you need ahead of time. First of all, you'll need to purchase a pet plane ticket if you're furry friend is small enough to ride in the cabin. Most airlines require you call after you've booked your flight. I know on Southwest I didn't pay for Heidi's ticket until I arrived at the check-in counter. You'll also want to check the airline's website for their sizing restrictions on pet carriers, because as I discovered, they are very nit picky about such things. I knew Heidi was going to hate being confined and had to make several trips to the vet to find the right medication to calm her down and also to test how long it would take to kick in (which ended up being two hours). 14. Accept help from family & friends. Sometimes I can be too proud to accept or ask for help, but when preparing for a life changing move it's important to embrace the support. I ended up moving after two major holidays, Christmas and my birthday, so I was able to ask for moving money and gift cards instead of the usual gifts (this was very helpful). It also never hurts to have friends or parents who own trucks, can carry heavy pieces of furniture, and most of all, are patient. 15. Stay positive and be patient! Even the best plans can fail, and at some point probably will, so remember to enjoy the process. For example, I hired movers that never showed up, and at the time I was really, really angry. But I quickly reminded myself that being mad wouldn't help anyone and that the best thing to do was solve the problem. Keep thinking about the end result, which is a successful move, and you'll get there! I know this was super long and I'm not sure anyone will make it through the whole post, but if you did thank you for reading! I hope this will prove helpful to those thinking or planning a big move. And if you are, congratulations! Enjoy every second and good luck! Thank you Kate! It was a lot of work to move, so hopefully it will be helpful for others and take some of the work out of the process!